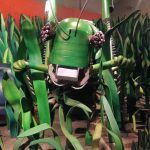 Readers of this blog already know that we love the Horniman and that it’s our local museum, so it’s no surprise that we really want to shout about their latest offering. 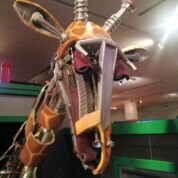 But I promise we’re not just biased on this occasion, the Robot Zoo really is worth the time and the entrance fee. 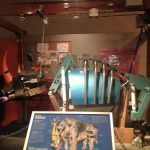 The exhibition consists of a collection, or “zoo”, of large animal robots, created so that you can see their inner workings. 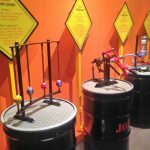 There are lots of interactive elements so that you can use an electronic pulley to raise the rhino’s head, press buttons to change the chameleon’s colour according to his mood, or hang on a bar like a bat. You really get a sense of the amazing mechanisms that allow animals to hide, hunt prey, see, eat and more. Our particular favourite is the jet-propelled racing squid game. 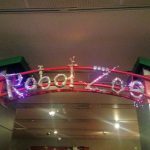 Robot Zoo is at the Horniman Museum until Sunday 29 October 2017 and costs from £7 (adult), £4 (child), £17 (family ticket).